Highly successful Wall Street trader and art collector Andrew Hall has been had. The cofounder of the Hall Art Foundation in Reading, Vt., recently filed suit against a former New Hampshire art history professor and her son for allegedly selling him 24 fake paintings. 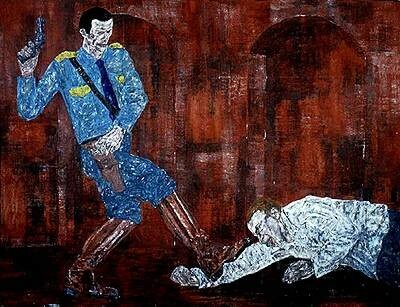 He had been told the works were by the American painter Leon Golub (1922-2004), known for his expressionistic depictions of inhumanity and violence. Hall is asking that the sellers, Lorettann and Nikolas Gascard, provide restitution of $676,250, the amount he paid for the artworks. The New York Times broke the story in an article posted online on Monday. The piece details how Hall acquired the 24 paintings from the Gascards. Hall had intended to mount a show of more than 60 Golub artworks at his Reading gallery, according to court documents. In the process of corroborating the Gascards' account of the paintings' provenance, Hall learned from Golub's family that they were forgeries. Lorettann, 68, and Nikolas, 34, are currently missing. They're also difficult to find online. A search for Lorettann turns up an unrelated 2014 disability suit she filed against her employer, Franklin Pierce University of Rindge, N.H., and a short editorial piece in the Berlin Observer from 1994 (scroll to page 6 for a photo). Lorettann obtained her doctorate from the Free University in Berlin in 1978. The article profiles her work teaching art history to American students studying abroad. "'My goal is to get the students to learn to read, not just view, art,'" the article quotes her saying. "'I tell them to build a relationship with the piece, communicate with it, don't just look at the pretty colors of interesting scenes.'" The Hall Art Foundation did not respond to a request for comment.